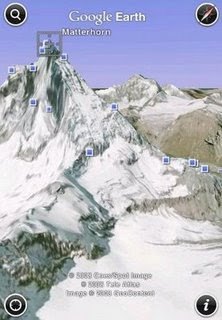 Google released Google Earth for Apple iPhone and iPod touch. Google Earth iPhone app makes full use of the handset, if you want to view the mountain terrain in landscape, just tilt your iPhone. You can use the “My Location” to jump right to where you are. You can use the application to navigate through the Earth in 3D modeling like the Google Earth on Desktop. Local Search is also available in Google Earth, giving you a convenient access to local business directory in your city. Google Earth for iPhone and iPod touch is a free download from the App Store, and is available now. Google Earth is one of the most famous and best designed program that maps the Earth according from images gathered through satellite, aerial photography and GPS functions.